More than 40 years ago, a Japanese farmer upended conventional thinking on agriculture with his path-breaking book, The One-Straw Revolution. In the book published in 1975, Masanobu Fukuoka advocated a return to natural farming, that is, applying the laws of nature to agricultural practices. It was a revolutionary concept that showed farming needed no external inputs at all. Fukuoka’s idea was simple: leave the Earth alone. No ploughing, no tilling, no use of chemicals or prepared fertilisers. Nor did he flood his rice fields as farmers in Asia have done from time immemorial. Yet, the one-time plant pathologist stunned the world with crop yields that equalled, if not surpassed, those of Japan’s best farms. In India farmers had practised natural farming for long till the Green Revolution steam rolled their traditional practices and forced them to adopt the modern system of high-cost chemical inputs and hybrid seeds. When the “revolution” began to fail and destroyed lands and livelihoods, some farmers began their search for a return to alternative systems. One of them was Subhash Palekar of Vidarbha, who had practised chemical farming till 1986. After several experiments, Palekar—he met Fukuoka when the Japanese philosopher visited India —put together a four-step technique of natural farming and promoted it widely across Karnataka as zero budget natural farming (ZBNF) with a crusading spirit, helped by the Karnataka Rajya Raitha Sangh, a farmers’ organisation. ZBNF’s biggest success came in Andhra Pradesh when the Rythu Sadhikara Samstha, a state-owned non-profit company, adopted it. Major funding has been earmarked for the programme, which Andhra Pradesh calls climate resilient ZBNF or CRZBNF. Across India there are thousands of farmers, possibly tens of thousands, who practise different forms of natural farming. Many others have been following the principles laid down by Fukuoka in his book without calling it the Fukuoka method. But Palekar has now caused consternation by telling his numerous followers that on popular demand and to make it more inclusive, ZBNF will, henceforth, be known as Subhash Palekar Spiritual Farming (SPSF). He claims many organisations, universities and scientists are willing to adopt this system, but have objected to the “zero budget” nomenclature. Their contention, according to Palekar, is that big farmers need to buy pumps, pipes and a host of other machinery for their operations, and as such cannot call it zero budget. The crux of the issue, however, is whether Palekar has registered a claim over ZBNF, either as copyright or a trademark since a patent is clearly out of the question in this case. 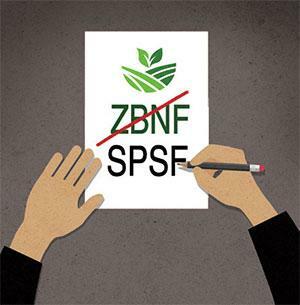 When he insists that ZBNF will have to be changed to SPSF, will it be backed by any legal right or a moral claim?